The wave style pictured below can be woven for you in the size and colors of your choice. Please contact Tina directly to make a purchase or commission her to weave you a custom wave. 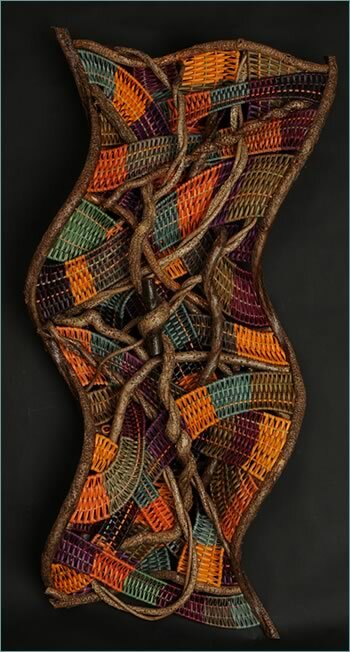 H 52" W 25" D 8"
This intricate, complex, and dramatically colorful wave-shaped wall sculpture was created by weaving bands of brightly colored reeds interwoven with spokes of contrasting colors throughout a network of tightly-twisted bittersweet vine. Tina has made the focal point of the piece a very tightly twisted bittersweet vine wound around a piece of alderwood. Networks of Color can be hung vertically, horizontally, or on an angle.